Seaweed: A misunderstood and neglected "vegetable"
As a longstanding fan of Japanese food, seaweed or sea vegetables (a great euphemism for those who don't care to eat "weeds") have grown on me as a tasty accompaniment to my sushi and sashimi. 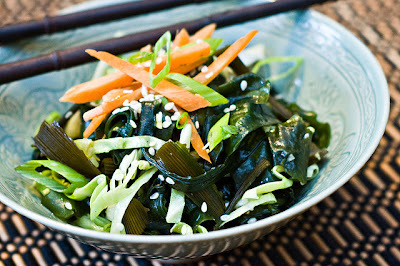 More recently, I have come to understand the value of including seaweed in our diets on a regular basis. Minerals are essential for health and seaweeds may be the single best food source for supplying our bodies with the essential minerals we all need. Seaweed not only supplies iodine, but also a balanced combination of the other essential minerals that humans require for optimal health. We have all heard of vitamins and minerals, but since vitamins (and vitamin deficiencies) have received most of the press, we rarely hear about mineral deficiencies. It turns out that minerals are just as essential to our health as vitamins. In fact, in modern societies mineral deficiencies are actually a much greater cause for concern than vitamin deficiencies. Welcome to Dr. Rebecca's Healthy Planet. I am in the planning stages of developing design and content thanks to a lot of help with the design from Laird and Malcolm. Since I have never done anything like this before, I am really concerned that the blog should be readable and interesting before I send it on it's way into the greater internet ethers. I am really hoping that I get a lot of suggestions and comments so that I can incorporate them into the design and gain some confidence that potential readers will find the design pleasing and the content easy to read.